(MoneyWatch) For many people, OneNote is an indispensable component of the Microsoft Office suite. A distant relative of Evernote and similar online note tools, OneNote is a powerful free-form text and graphics tool that can be used for meeting minutes, research, organizing brainstorming sessions, and a variety of other note taking activities. OneNote has long been available for the iPad -- a natural device on which to use it -- but the app has been hobbled by some intentional shortcomings. 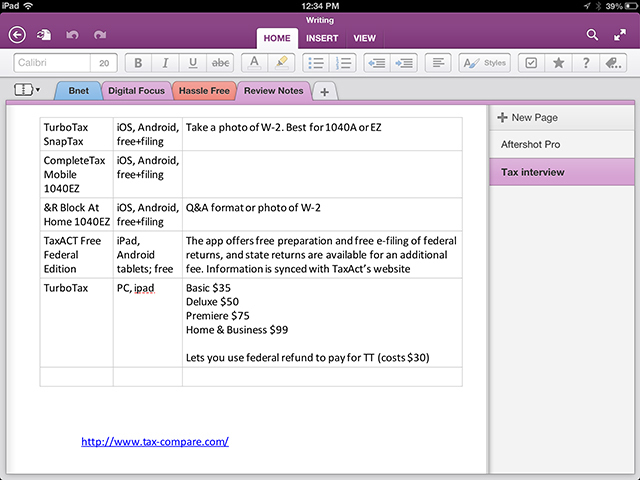 Thanks to a recent update, OneNote has been given a new lease on life. Last week, an update to OneNote now lets you create and modify not just sections within notebooks, but entire notebooks as well. Previously, the only way to add a section to an existing notebook, for example, was to do it on your desktop copy of OneNote and then let that change sync back to the iPad. Now, there's a New Page command at the top of the sections list on the iPad -- tap it to add new sections with abandon. You can also make entirely new notebooks, and store them in the cloud using SkyDrive. That might not sound like a lot, but trust me: It's significant. Until now, iPad users were chained to their desktop to make substantive changes to OneNote. Now, the desktop is nonessential. That means you can get all of your notetaking needs satisfied with the iPad alone. There are a few other small improvements in the update, such as the fact that OneNote now automatically detects lists as you create them, so you don't have to manually format lists after the fact. But the real treat here is the complete "untethering" from the desktop. This is a bold step for Microsoft, as the missing features were no doubt a way to offer OneNote on iOS while continuing to make the Windows version a more attractive deal. You can read all about the changes at the Microsoft Blog, and install OneNote for free from the iOS app store.